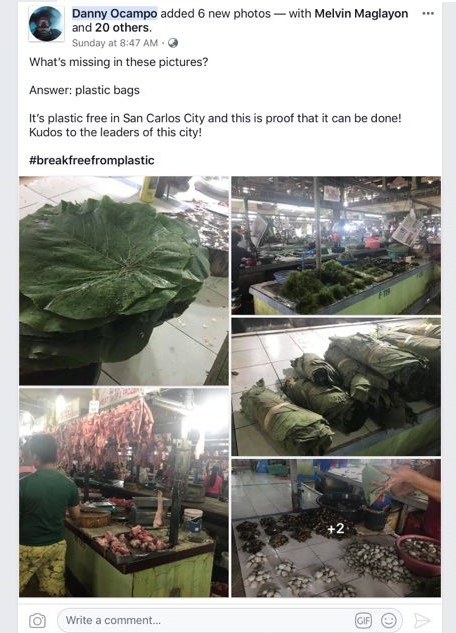 San Carlos City in Negros Occidental is one to more cities in the country that are taking on the plastic ban. It's a step to zero plastic waste goal and were happy to see. Unsurprisingly people uses their resourcefulness and those bundles of colorful plastic bags have been replaced by bunched leaves, old newspapers, and reusable net bags. And it's good to see people had managed to innovate other alternatives just to operate without plastic bags. In 2014, San Carlos City passed an ordinance regulating the use of plastic cellophane, t-shirt bags and expanded polystyrene or Styrofoam as packaging materials for food and beverages. The ordinance also encourages the use of alternative packaging materials for food and beverages, and encourages citizens to bring their own bags for shopping. The ordinance has been successful in transforming even the city’s wet market as a plastic-free zone—vendors use traditional leaves to wrap wet goods such as fish and meat. The ordinance was effective in raising awareness about the impact of plastic and Styrofoam. Enforcers have noted a marked decrease in the number of violations, from 52 cases in 2015 to 27 cases in 2017. Cheers to the City of San Carlos for a job well done and hoping that other municipalities in the country will do the same way to protect the environment.